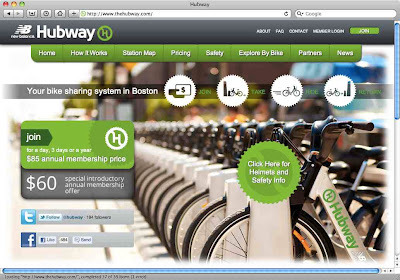 Boston-metro's Hubway bikeshare system kicks off soon with Launch Event and Inaugural Ride on Thursday, July 28th! "New Balance Hubway bikes are easy, fun and safe to use and ride. They are step-thru frames, have 3 speeds, front and rear flashing LED lights and a handy front rack. Plus the internal hub gears, chain guard and fenders keep you riding clean, confidently and in style. [...] Installation of the system will begin in July 2011 with more than 600 bicycles at 61 stations to be located widely throughout Boston. 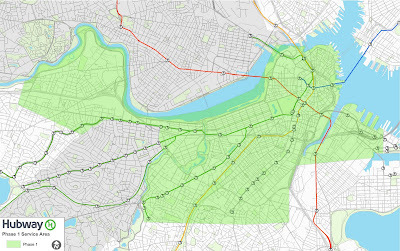 Hubway will eventually expand into Cambridge, Somerville and Brookline, creating a single regional system." Phase I Service Area is Boston-core, but expansion to come soon! And here's Alison Cohen herself, the operator-in-charge, welcoming one and all to participate in Hubway!